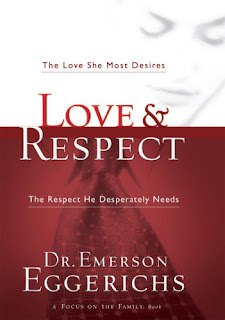 I received and read the book Love & Respect: The Love She Most Desires; The Respect He Desperately Needs by Dr. Emerson Eggerichs compliments of Thomas Nelson. Dr. Eggerich was the senior pastor of East Lansing Trinity Church before deciding to launch his full time mission in helping people achieve healthy marriages. Dr. Eggerich has a M.A. in communications, a Master's of Divinity and a Ph.D. in child and family ecology. He and his wife, who joins in the conferences and marital help, reside in Michigan and they have three adult children. He is the president of Love and Respect Ministeries. The book takes a biblical approach when teaching men and women to understand how a husband and a wife fit together in a marriage. At first, I had the sense that this was a book that emphasized a need of the wife to succumb to the husband's wishes and commands. As I kept reading through the different chapters and tests, it became so amazingly clear where he was coming from and how it applied to every marriage. Dr. Eggerich has a keen ability to understand the differences in men and women by using such phrases as "blue glasses" and "pink glasses" or "blue hearing aids" and "pink hearing aids." It was nice reading the excerpts he provided from real couples to see that I wasn't alone in the struggle of making it all fit together and work. The excerpts validated what he was teaching and showed that the exercises/tests he provides each to do, in fact work. I ended up taking the principles and used some of the tests and have found that it truly is effective. I am a believer in this book for anyone. Whether you are in a relationship or not, the book teaches invaluables aspects of what men and women, in general, crave and need while discussing how you can give to the other while receiving what you need. The whole concept of love and respect are fully discussed and thoughtfully introduced in a way that opens ones eyes and will lead to a better relationship. The one thing I would have liked to have seen, is a more of an emphasis of how to handle marriages when there is a breakdown on fairness of household chores/children. He noted a good example of a wife not wanting to break from doing a chore to sit and watch TV with her husband due to the "to do list" she still has to do. I think that a lot of marital discord evolves around not only money but how the wife tends to work full time and still tends to the house and children full time. Perhaps if the "Crazy Cycle" is broken and the wife gives the husband his needed respect, the husband will come around to help more because he will be willing to show more of his love. All in all, I highly recommend this book! Amazon readers, 313 in all, gave this book 4.5 stars!